Amethyst gemstone comes with a lot of tales and lore. In fact, if you break down the name, it translates into “not drunken.” The meaning of amethyst comes from Latin origins of the word “amethystus.” It is called so because it was believed that the stone holds power against inebriation. It was said that if you drank from the gauntlet made from this stone, you’d never get drunk. The ancients also referred to it “Gem of Fire” because of how passionate and intense its hues are. There a wonderful Greek legend behind the name of this stone, which teaches us lessons of harsh and impulsive acts. Now, when it comes to the supply of this stone, it sheds light on its rarity. The crystal is mined in Brazil, where is found in large geodes. These volcanic rocks are found naturally with hollowed crystalized formation sitting beautifully inside. These amethyst geodes are also sold in their natural form, known and coveted for their unique and cherished look. The finer grade of amethyst is also mined from Russia, but there are also mines found in South Korea and Australia. The mines in Brazil come abundantly gifted with this stunning gem. This mining procedure is done under the earth, where these geodes are lodged in volcanic rocks. The workers work through the tunnel veins to find the rocks. The geodes are then hollowed out using precise machine process or even by hands. A process called “cobbing” takes care of the removal of unwanted mass, where the unwanted parts are gently hammered away. The biggest and the most commonly determining factor of the stone is its colour. Amethyst stone is costlier as it gets darker in shade. The stone boasts of a rich and spell-binding rare violet shade. As the quality of the stone goes up, the shade gets darker to the point of reddish violet tones, which are passionate, rare, and expensive. Like most other crystals, your amethyst gem is going to be expensive if it’s absolutely clear and absent of visual obstructions. Most of amethyst crystals in jewellery have no visual inclusions, at least the one visible to the naked eye. However, if you use the magnification, you can determine its grade by observing how clean it is. Another redeeming factor of your stone’s quality will be its cut. Amethyst is a stone that’s more expensive as it gets larger. The more popular cuts are round and oval, which are ideal to be used as centrally placed stones in jewellery design ideas. The quality of the amethyst gem that you have can certainly be determined with its carat weight. This is a gem that’s available in several sizes and carat weights. However, it is deemed to be noted that the traditional cuts amount to only about 8% of the production. It leaves scope for different sizes and weights. While amethyst is a gem that’s naturally found and resourced, sometimes it goes through artificial treatment to elevate its beauty. The heat treatment given to it helps clear out the colour, but it is a completely naturally occurring stone that needs no help. Mined straight this way, it has an engaging combination of colour and clarity that make it an enigma. The deep and indulgent hues of amethyst are idyllic in the centre of every design. Aesthetically, it is a gem that can be paired with a myriad of different colours and shades. However, if you’re looking to enhance its healing benefits, there are lots of beliefs around that, too. In the healers’ community, amethyst is regarded as a powerful stone. It is a crystal that harbours lots of positive strengths. That said, they believe that pairing this gem with other suiting stones, you can reap in more strength, peace, and positivity. Here are some stones that pair well with the mystical prowess of amethyst gemstone. Healers say that among amethyst properties is its strength to protect the wearer from negativity. It protects the physical and mental stability and brings inner confidence. They suggest that if you’re indulging in new relationships, you ought to pair your amethyst with a rose quartz. Rose-coloured quartz is considered to bring you love, passion, and joy. The combination of these two stones is perfect if you’re beginning a new relationship and are a bit on the fence. It will not only make you better closer and more attached to your beloved, but also act as an emotional armour. Another fabulous combination believed to be magical by astrologers and healers is the combination of amethyst stone and any among the clear quartz collection. Both the crystals are believed to harbour and bring positivity to the wearer. When speaking of clear quartz, it is believed to be among the most powerful healing stones. It flushed out the negative energy from the wearer and heals you inside out, many healers claim. They also maintain that if you wear quartz with amethyst’s protective tendencies, the combination gives you battling energy. Many healers believe that even as much as placing the rock in the right corner of your room can prove to be quite positive. Several people love and adore decorating amethyst crystals or amethyst geodes as their room décor. While that’s majorly done for the rock’s aesthetically pleasing qualities, it goes much deeper than that. Healers say that amethyst is a stone of power. If you place it in the room, it aids family bonding and protects your place from negativity, evil eye, and other threatening forces. If you place the crystal at your workplace, it’ll help you in making decisions, will help ease communication, and give you confidence, or so several healers claim. 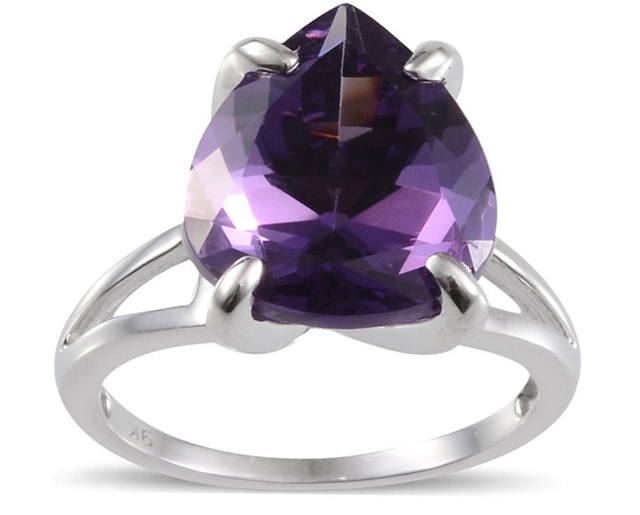 Quite commonly used a prized gemstone in rings, pendants, earrings, and more amethyst stone is a charmer, healers say. They say that the mighty stone truly helps in transforming the negative and hostile energy into positive and relaxing. The gem is also believed to protect you against psychic attacks and paranormal incidents. In fact, some people go as far as to claim that wearing amethyst geode or unpolished natural amethyst has aided their psychic powers, gracing them with better intuition. Initially, upon its discovery, amethyst stone was considered to be rare and exceptional. However, later its deposits were abundantly found. Regardless, it is still one of the best stones loved by several connoisseurs and jewellery enthusiasts. It’s rich, sparkling, and intense notes of deep violet are coveted by many! And not only its polished and cut form, raw amethyst geodes are equally as popular. In fact, the hollow geodes in larger sizes are the perfect picture sports for several, too! But what if you don’t wish to wear amethyst? Well, whatever your reason might be, we’re here to help. Find here other gems that look and fall in the range of amethyst itself. With similar purple colour, iolite also has similar purple tones that makes them incredibly cherished in jewellery designs. Found in abundance, hey have low price points. Their stunning purple colours look just like amethyst, but at lower prices. Ranking 7-8 on the Mohs Scale of Hardness, they are perfect for bring embellished in jewellery ideas. Another stunning gem that resembles the smooth colours of amethyst beads is purple jade. Waxy in finish and glorious in colour, the stone is much revered in the jewellery world. It is comparatively cheaper and comes in abundance of other hues as well. If you’re looking a little higher on the end of luxury, then this is just the crystal for you. Matching the violet and purple tones of amethyst in the best grade, purple sapphire is a beautiful stone for your jewellery pieces. We have some hypnotizing designs in store that will cast a spell on you with their royal beauty. But if you’re looking for the crystals that have the same clarity as that of amethyst, then we have options for those as well. In fact, you can choose from our beautiful collection quartz jewellery collection, which promises you a gamut of different hues and shades, some also transfusing into one another. From iconic yellow to the deepest shades of green and red, the entire palette is yours to wear and flaunt. What to Remember While Buying Amethyst? 1. Unlike other crystals, amethyst stone has richer shades in smaller sizes as well. That said, it looks incredible in mammoth sizes, so you can choose to go bold with a behemoth centre stone design, too. 2. Amethyst isn’t a costly gemstone. In fact, due to its recently found abundance, it is among the more affordable gems. The larger sizes and carat weighs don’t have much effect on the prices of these crystals, either. 3. Remember that amethyst is worn best in its crystalline way. Do not compromise on the cut. You should opt for a stone that comes with a higher count of faceting that lets it sparkle from every direction. 5. When you’re shopping for this stone, you must also know that there are grades of quartz that are available in the same colour, too. While amethyst is a naturally occurring stone, there are treatments of irridation given to clear quartz, too, to make them resemble amethyst. Always ask your jeweller about the authenticity of the stone and if it’s treated. Counted among the more powerful and effective ones, amethyst birthstone is a true choice of many. It is beneficial for the February born and brings them hoards f luck, joy, and happiness. For the people born under the sign of Pieces, amethyst stone is the one that brings them luck. Amethyst’s meaning is related with the Greek word “amesthystus,” which translates into “not drunken.” It was believed that if you drank out of chalices made from or studded with amethysts rocks, you won’t get drunk. Amethyst’s healing properties are known famously in the healing world. It is considered to be among the most powerful healing crystals. It is also believed that it provides physical and mental strength. Some people say that if you dream of amethyst, it means you’re guarded and safe from evil eye and negativity. Amethyst and citrine are called sister stones, as the only difference between them is their colour. Amethyst’s powers are considered strong and helpful in the healing world. It is believed that it can help in curing Obsessive Compulsive Disorder. It may also be used to control anxiety. Amethyst stone is known for its royal hues all across the world. In fact, it can be seen in the treasury of Royal British Jewels, too. What is the meaning of amethyst? Amethyst is regarded as one of the most sacred spiritual stones in the healing community. The spiritual healing of amethyst brings the wearer cleansing and healing from the negative energies. What are benefits of wearing amethyst? Other than the aesthetic brilliance of the sparkling gemstone, it has metaphysical properties, too. It is considered to bring peace and protects the wearer against evil eye and negative energy. It also enhances your intuitive powers. Does amethyst help with anxiety? Many healers across the globe claim that wearing amethysts calms you down a lot. In fact, even if you place in the corner of the room, it has strong positive waves that help you gain confidence, hence, decreasing anxiety. Are there any negative effects of wearing amethyst? No, amethyst is regarded as a strong and powerful positive stone, with its spiritual vibrations being used for cleansing. It blocks out the negativity and keeps you absolutely safe. Yes, amethyst stone has been considered to be among the most treasured and valuable stones since ancient times. It is, however, abundantly found, which makes it inexpensive. No, the said stone ranks very high on the Mohs Scale of Hardness, at 7. With only sapphire and diamonds above it, it is tough, resilient, and safe from easy scratching. How do you clean amethyst stone? Cleaning of the stone requires warm water and liquid soap solution. Use mild detergent and soak the stone in soapy water for about 15 minutes. Gently wipe the grime from it using a soft washcloth and let it air dry. Does amethyst fade in the Sun? Like other coloured quartz, amethyst crystal does in fact fade in the Sun. What’s more troubling is that there is no way to restore the colour once it’s faded. Try not to wear the crystal in the Sun for longer duration. Amethyst is a naturally-occurring gemstone and is not usually artificially synthesized. However, some of its lighter colours are treated with heat to enhance to hue. In some cases, you may find the practice of colouring of clear quartz till it turns purple. What amethyst colour is the most valuable? While amethyst is a gemstone that’s available in a rich scale of purple, from light lilac to deep violet, the best shade of it is regarded as the passionate and intense shades of purple. As the colour gets darker, the value of this gem increases.